Description: Installation of both the Raw Water Intake and Cooling Water Outfall for the Carrington CCGT Power Plant in Manchester, UK. The intake and outfall both extend approximately 10m from water’s edge into the Manchester Ship Canal (MSC). Phase 1: Construction of a 9m wide by 9m long working platform into the MSC to facilitate the installation of the reception cofferdam. The platform construction was completed by driving 10m long piles with a support frame which utilised skin friction and active ground resistance for stability. The working platform was designed to allow a 70t crawler crane track down on it and recover the TBM which weighed 14t. Phase 2: Installed sealed cofferdam in the MSC using an excavator mounted Movax SPH 80 vibro-hammer and a crane mounted impact hammer. 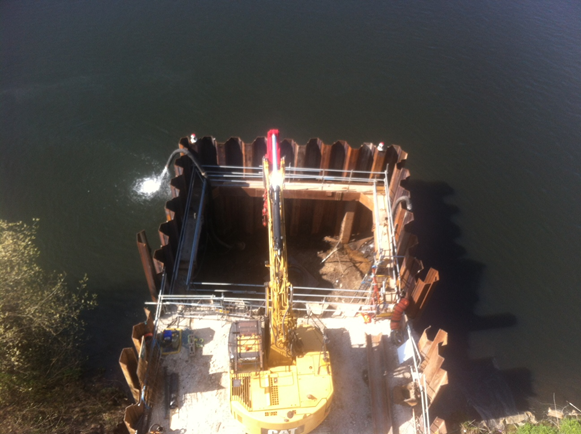 Phase 3: Tunnelled from the pumping station to the cofferdam using a Herrenknecht AVN 1200 machine. Recovered the machine in the cofferdam. Phase 4: Installed carbon steel pipe welding 5 number joints to ASME 9 specifications. Installed filters and penstock and pressure grout the annulus between the product pipe and the carrier pipe. Installed marker posts. Ward & Burke fully designed, supplied and constructed all elements of the scope for this contract. The outfall construction consisted of installing both working platforms and a cofferdam located in the MSC as per the intake methodology. A 600mm HDPE pipe wall laid in the cofferdam through the working platform to an outfall manhole. A major challenge of the job was due to access, the location of the pumping station on the site dictated limited space and access for the construction works and so the crane was limited to a 70t crawler crane.